Before anyone jumps to the wrong conclusions, I was sent a free review copy of this book, rather than because I’m investigating IVF! The author says she is a very private person, so it must have taken huge courage to share such personal information with the world at large, and utter conviction to get out there and promote it – especially now that she has her hands full with raising twins! It must be stressed this is a personal account by a non-medical person and only conveys what were the right decisions for the author – e.g. switching clinics and methods part-way through her journey, and going private, but even so, it would be a compelling and invaluable read for anyone considering or undergoing IVF themselves. It would also be a helpful source of inside information for anyone with friends or relations going through the treatment, who wants to know more about it (and how to be supportive) but is nervous of intruding on their privacy by asking questions about it. Tru’s story makes it very clear that IVF is not just an incredibly complex medical procedure that takes over your whole life for months or even years at a time, but is also a huge strain on the would-be mother and father, physically, emotionally and mentally. Tru was one of the lucky ones – IVF gave her the family that she yearned for. Many are not so fortunate. Tru makes it clear that this very expensive treatment is not a guaranteed fix – it would have been entirely possible for this story to have ended in continuing childlessness. That would have been an even harder book to write. If you are contemplating undergoing IVF, or know someone who is, I recommend that you read this book first, to decide whether you or they have the stamina for it – and to be clear that there is absolutely no shame in deciding that this highly interventional process is not for you. I’d also recommend it for medical staff working in this field, to help them understand more clearly exactly what it feels like, physically, mentally and emotionally, to be the patient – something that’s too easy to forget, as with any medical procedure, when administering it is simply your job and your daily routine. By the way, I love the fact that this book has a light, pretty, non-threatening, non-medical cover in the colours of sugared almonds – it’s almost like a recommended decorating theme for the nursery. A nice, optimistic, gentle touch. I wish Tru Spencer and her family all the best – they’ve earned it. 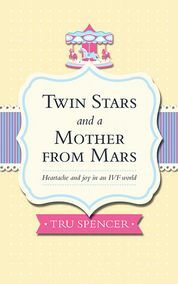 Tru’s book is published by SilverWood Books – find out more on their website here. This looks a very interesting and useful book, and I’m sure should be read by anyone contemplating going through IVF. I don’t know whether the situation has got much better since I researched the subject for my novel ‘Cells’. It can be heartbreaking, I think. My novel is about a woman who has tried IVF but it hasn’t worked and she’s trying to move on. I was interested to explore what felt like a very modern dilemma for women. Thank you for a great review. Thanks, Harriet, and I’m looking forward to reading your novel “Cells”, too – it will be interesting to compare the real life story with your fictionalised one.